Hot Water Heater Repair or replacement can often be the result of a real plumbing emergency. If you discover that your hot water heater has sprung a leak, you need help fast and Herrera Plumbing Service will respond quickly to minimize damage and inconvenience. With over 100 years of combined plumbing experience, you can be confident that there isn't a water heater out there that our professional plumbers can't handle. Whether yours is a gas, electric or tankless water heater, the team at Herrera Plumbing Service can assist with hot water heater repair, replacement or installation. Does Your Hot Water Heater Need Attention? Nesecita Repacion Del Boiler? 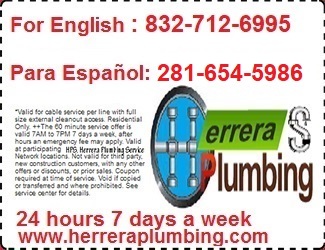 If you have noticed water in the drain pan it's time to call Herrera Plumbing Service and arrange for our professional plumbers to install a replacement heater. A leaking water heater is also increasing the cost of your water bills. If your water heater problem is more catastrophic - the heater has burst or is leaking large amounts of water, call for emergency plumbing assistance from Herrera Plumbing Service, your 24 hour emergency plumber. We will also assist you in putting together the paperwork required to lodge your insurance claim. Have you been left in the lurch by an unreliable tradesman and need to resolve a plumbing violation quickly and easily so you can get on with life? Herrera Plumbing Service will take on your plumbing violation and ensure that it is cured as professionally and quickly. When buying a home you need to be sure of the health of the plumbing system. Herrera Plumbing Service will provide home plumbing inspections or property inspections so there are no unpleasant plumbing surprises for you to deal with later.